What do you get if you take 17 women out for a coffee shop crawl? Lots of different opinions and all of them good! We set out five times in different directions, armed with sheets of paper containing questionnaires for each stop, as well as cameras to take the evidence back home. Trains, minibuses, cars : we used them all! As well as good coffee beans, nice cutlery, good dishwashers, heating cupboard, big oven, multiple hob spaces and a tempting but realistic menu, we also wanted stable tables which didn’t wobble; comfy chairs for little or long legs; accessible seating which didn’t stick out and leg you up, whether you were a wheelchair user or parent with a buggy; highchairs for kids, comfy settees for young ones as well as armchairs and tub chairs: and decent, unobtrusive music. The priority hit list included good lighting, nice pictures on the walls, green plants with signature peace lilies, and that indefinable something called “ambience”. The patient architect battled and won against the committee’s persistent urge for bright red chairs or vivid green covers, so it is coffee- coloured walls with mushroom and white paintwork which won our hearts and the combination is calming, restful, allowing the seats and stained glass window to speak for themselves. Special chair fabric encourages absolutely everyone to sit and find comfort in a peaceful moment with no one rushing you out, giving time to sit all morning and afternoon if you like, sometimes nodding off, knitting or reading. We bounced on and off sofas, tried countless coffees, feverishly admired the frothy coffee machines, made many notes, had great debates about every minute detail including plants, mirrors and photos for the walls, and then appointed a calm and experienced builder who was a delight to have working here. Miles of plastic sheeting and dust like the Sahara greeted us for months on end – it was a massive task because all the regular life of the church carried on – pre-school each day, Thursday lunches in the confined space of the guild room (miraculous really! ), as well as Sunday services which meant climbing over planks and bricks. We just kept cleaning, sweeping and mopping with gusto, till the day came when the builders sadly left , the sofas were delivered, the splendid logo was peeled onto the Café wall, the cutlery and kitchen equipment arrived and we sighed as we sat on the first settees, unable to believe we had done it at last! 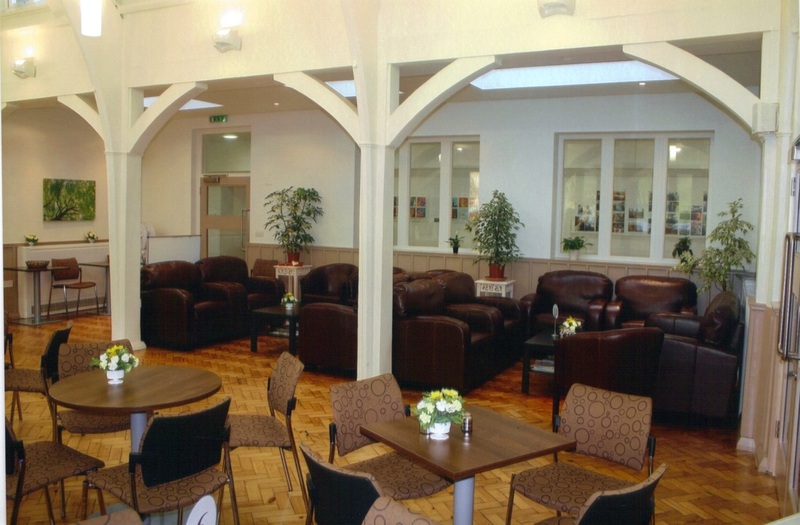 We needn’t have worried – whilst there are only a few days in the week when it is manic and volunteers are rushed off their feet and there are moments in each day when someone is exhausted, yet in the first five months we have had a footfall of over 4, 721 and been delighted to see how much the café is valued locally. Some comments show how the vision God laid on our hearts is bearing fruit so that people’s needs of deep loneliness and feeling afraid are being helped in small ways. 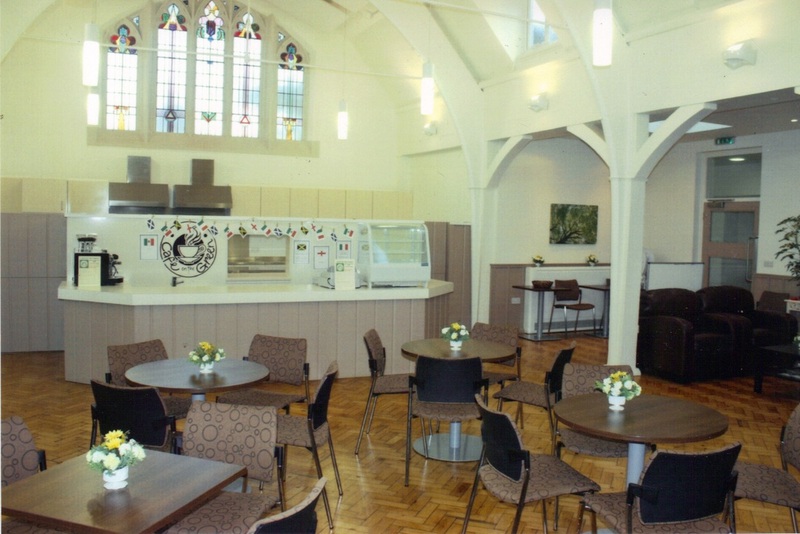 Friendships have been forged over the dishwasher, customers have become friends, the church has found a focus in showing practical love and care – and how God has blessed and enriched the endeavour. The Café Manager is a gem and her team of volunteers are truly remarkable, for everyone can now cook, clean and waitress - though the best job is “welcomer” on the door! What is the Café really like for ambience then? Ah – you will have to come and see for yourself! Open each weekday from 10.30am till 1.30pm (but often earlier and later!) Café on the Green awaits you!